The index said Dublin seems to have “slipped into apathy” in the last two years. Ouch. 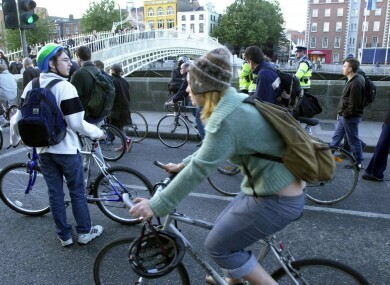 DUBLIN HAS FALLEN four places in an index of top cycling cities in the world. The Copenhagenize Index lists Dublin as the 15th best city (out of 20) for cycling, down from 11th place in the last index in 2013. The first index in 2011 ranked Dublin 9th in the world. Our downgrade is due to a lack of action over the last two years, following a period of investment in programmes like Dublinbikes, the index said. “Dublin seems to be suffering from the same malady as other cities that have made impressive progress. They have seemingly slipped into apathy – and a few places down the Index. What Dublin has achieved over the past few years is fantastic. The perfect cocktail of politicians who get it, investment in infrastructure and facilities, traffic calming measures and an epic bike share system accelerated the city’s journey to urban modernisation. You can’t take that away from Dublin, but you could wish for another period of concerted effort. “Choosing sub-standard infrastructure along the Quays is not exactly the way to go if you’re trying to develop a cohesive network for the next 100 years,” according to the index. While the bike share scheme “rocks”, we now our network and bicycle strategy should be “developed and followed to the letter”. These sentiments were echoed by Keith Byrne of the Dublin Cycle Campaign who said that while Dublinbikes was a success, and there has been an increase in people using them, the lack of investment in infrastructure for cyclist has meant they are competing more and more for road usage. Though ideas for a number of significant cycle paths in the city have been discussed in the last two years, no work has ever started on any of them. In March, Dublin City Council announced plans for a path along the Royal Canal, but construction on this is not expected to get underway until 2016. “We know there are great plans but we need to get on with them if we want to stay on the list,” Byrne said. Email “Dublin is not as cycle-friendly as it used to be”. Feedback on “Dublin is not as cycle-friendly as it used to be”.